Upstate New York is the region of the U.S. state of New York generally north of New York City. The region includes all of the state of New York, excluding New York City and its environs, as well as Long Island, though the precise boundary is debated. Upstate New York includes the major cities of Buffalo, Rochester, Albany, and Syracuse. Before the American Revolutionary War, Upstate was populated by Native Americans, and was home to the Six Nations of the Iroquois Confederacy. The region saw many battles between the Continental Army and the Iroqoius, and several treaties drawn up after the war ceded much of the land to settlers of European descent. The development of Upstate New York was spurred by the opening of the Erie Canal in 1825, which greatly eased the transport of goods between the port of New York City and inland cities along the Great Lakes. As a result, Upstate became a hotbed for manufacturing, giving birth to such firms as General Electric, IBM, Kodak, and Xerox, and it welcomed a large influx of immigrants. Since the mid 20th century, American deindustrialization has contributed to economic and population decline Upstate, and the region is largely considered part of the Rust Belt. 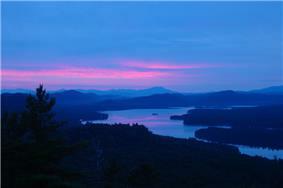 View of the Fulton Chain Lakes (4th Lake) in the Adirondack Park, from Bald Mountain. Unlike the New York metropolitan area, Upstate New York contains vast areas of rural land. As a result, Upstate also supports a strong agriculture industry, and is notable for its milk and dairy products, its fruit production (especially apples), and winemaking. New York City is dependent on the natural resources of Upstate for a variety of services, including the city's water supply and electricity. The region is home to several popular tourist and recreational destinations, including Niagara Falls, the Adirondack and Catskill Mountains, and the Finger Lakes. 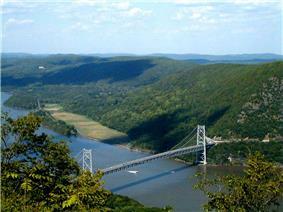 The Bear Mountain Bridge across the Hudson River, as seen from Bear Mountain. This region has been considered both Upstate and Downstate. There is no clear official boundary between Upstate New York and Downstate New York. The broadest usage of the term Upstate New York excludes only New York City and Long Island, which are always considered to be part of Downstate New York. Another usage locates the Upstate/Downstate boundary further north, at the point where New York City's suburbs segue into its exurbs, as the exurbs do not fall within the US Census' urban area. This boundary places most, but not all, of Westchester and Rockland Counties in Downstate, while putting the northwestern edge of Rockland County as well as the northernmost quarter of Westchester County (including Peekskill) in Upstate. Yet another definition uses the prior Census definition of the New York metropolitan area, which until 2010 included Westchester, Rockland, and Putnam Counties. This was the definition used by the plaintiffs in the federal redistricting case of Rodriguez v. Pataki. Residents of Upstate New York sometimes prefer to identify with a more specific Upstate Collegiate Athletic Association, the Upstate Correctional Facility, the Upstate New York Club Hockey League, the Upstate New York Synod, and the Upstate Citizens for Equality. The term Upstate America is also occasionally used instead of "Upstate New York" (see, for instance, some of the work of Albany political reporter Jimmy Vielkind) to emphasize the differences between upstate and downstate New York, sometimes in comparison to other similar states in the northern tier of the United States. The other regions of New York State are culturally and economically distinct from the New York City area and in many ways from each other. Most of New York State is characterized both by agricultural and forested rural communities, and by small and medium-sized cities and their surrounding suburbs located along major transportation corridors. The state's major metropolitan areas outside of New York City are Buffalo, Rochester, Albany-Schenectady-Troy, and Syracuse, each of whose population exceeds 500,000. The different regions of New York State are influenced by and have affinities with other adjacent regions. Western New York has cultural and economic ties to the other Great Lakes states as well as Southern Ontario. 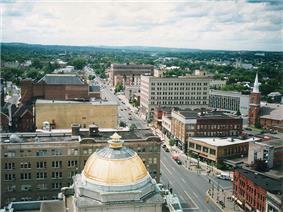 The Capital District, the Hudson Valley, the Mohawk Valley and the Plattsburgh area have ties to New England. The North Country, the extreme northern portion of the state, also has strong cultural, economic, linguistic and familial ties to Quebec and Eastern Ontario. Thus, Plattsburgh has close ties to its neighbors in the Montreal area as well as Vermont. Much of New York State receives television and radio broadcasts from Canada and there are often other cross-border ties, both historical and familial. A similar relationship can be seen in Northern New England. Linguistically, upstate New York from Western New York east to Utica is part of the Inland North region of American English dialectology, a region which includes Midwestern cities as far west as Chicago and Milwaukee. The Hudson and lower Mohawk Valley has more in common dialectologically with western New England and New York City. The boundary between the use of the words pop and soda to refer to soft drinks, however, falls farther west than the edge of the Inland North, running just to the east of the city of Rochester: Buffalo and Rochester use pop, like the rest of the Inland North to the west, whereas Syracuse and Binghamton use soda, like New England and New York City. In Ithaca and Elmira, the border is less clear, with some people having grown up with pop and some with soda; however, current trends see Ithaca, at least, turning to mostly "soda." Although the potato chip was invented in Saratoga Springs, it has achieved such universal popularity that it is no longer identified with the region. Winemaking is a growing industry in the Finger Lakes as well as in Chautauqua County, where Welch's operates one of the oldest extant grape juice factories in the United States. In the center of the Finger Lakes region, Ithaca is known for the Bo Burger, a cheeseburger with a fried egg on top. Two of the most important rock festivals of the 20th century were held in Upstate New York. 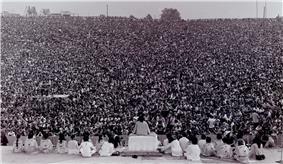 In 1969 the Woodstock Festival was held in Bethel, New York, while in 1973 another multiday festival was held at the Watkins Glen International Raceway. Some literary, documentary and cinematic depictions of upstate present a sense of small town, simple lifestyles, such as It's a Wonderful Life, set in a small upstate town in the 1940s. Ancestries from across the United States. The population of New York State is 19,746,227, with 11,323,961 living in either New York City or Long Island, leaving only 8,422,266 for the entire rest of the state. This means Upstate NY has a population density far lower than that of downstate. Upstate is typified by farmland and forest, many large lakes, and two mountain ranges, with a few metro areas dotting the map here and there. Residents of English colonial ancestry are common, as well as German, Irish, and Italian, with most metropolitan counties having a similar number of residents from each group. The North Country is heavily French Canadian. Italian Americans are the largest ethnic group in Oneida County, as well as in some counties in the Hudson Valley that are closest to New York City. Irish Americans represent the largest ethnic group from the Capital District, Syracuse, Binghamton, and the rest of the Hudson Valley, though they also have large Italian American populations; Irish population is consistently above 15% in most of upstate New York (reaching over 20% in the upper Hudson Valley), compared to less than 8% in most of New York City. 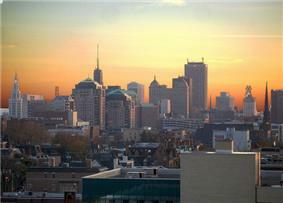 Buffalo also contains a notably large contingent of residents with Polish ancestry. African Americans, while not as numerous as in New York City, make up at least 25% of the residents in cities such as Buffalo, Rochester, Syracuse, and Albany. There is also a significant presence of the indigenous Haudenosaunee or Six Nations in the region, who retain several reservations: the Seneca nation and Tonawanda Band of Seneca Indians in Western New York, the Onondaga nation south of Syracuse, the Oneida nation of Oneida County and the Mohawk nation in Franklin County. Members of the Six Nations also live in the cities of Upstate New York. The headwaters of the Delaware, Susquehanna, Hudson, and Allegheny rivers are located in the region. 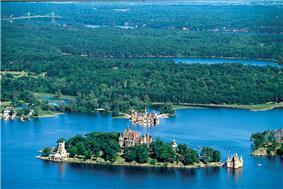 The region is characterized by the major mountain ranges, large lakes, and extensive forests. The Allegheny Plateau extends into west and central New York from the south. The Catskill Mountains lie in the southeastern part of the state, closer to New York City. The Catskills and the Allegheny Plateau are both part of the Appalachian Mountains. The northernmost part of the state contains the Adirondack Mountains, which are sometimes considered part of the Appalachians but are geologically separate, a southern extension of the Canadian Shield. In the more mountainous eastern part of Upstate New York, the valleys of the Hudson River and the Mohawk River were historically important travel corridors and remain so today. Western New York in the vicinity of Buffalo is very flat, as it was once the bottom of a glacial lake. The only "hills" in Niagara County are the Niagara Escarpment, which formed the Falls. Upstate has a long shared border with Canadian province of Ontario divided by water; including the Lake Erie, Niagara River, Lake Ontario and the St. Lawrence River. It shares a land border with the province of Quebec in the northernmost part of the state. The sizes of upstate counties and towns are generally larger in area and smaller in population, compared with the downstate region, although there are exceptions. The state's smallest county in population (Hamilton County) and largest county in area (St. Lawrence County on the state's northern border) are both in Upstate New York, while the largest in population (Kings County) and smallest in area (New York County) are both part of New York City. Average seasonal snowfall totals for areas impacted by lake-effect snow in New York (in inches). Upstate New York is well known for its cold and snowy winters, particularly in comparison to the more temperate climate of downstate New York. 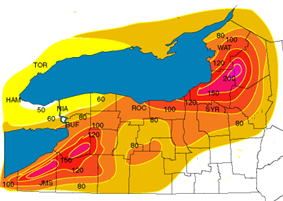 The snowy reputation is especially true for the cities of Buffalo, Rochester, Oswego and Syracuse, and is largely due to Saranac Lake, both in the Adirondacks, often vie on winter nights with places like International Falls, Minnesota and Fargo, North Dakota for the coldest spot in the nation. Many of the features of the upstate landscape, such as the Finger Lakes and the drumlins that dot the region, are the result of glaciers during the Ice Age. The region was important from the first days of both French and Dutch colonization In the seventeenth century. The New Netherland colony encompassed the Hudson Valley from Manhattan island north to the confluence of the Hudson and Mohawk rivers, where Fort Orange (later Albany) was established in 1623. 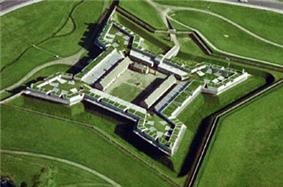 The fort at Schenectady, New York was built in 1661. The upper Hudson Valley was the center of much of the colony's fur trade, which was highly lucrative, serving a demand for furs in Europe. North and west of New Netherland, the French established trading posts along the St. Lawrence River and as far south as the shores of Onondaga Lake. They found both trading and proselytizing difficult among the Haudenosaunee, as Samuel de Champlain had alienated the Haudenosaunee during military forays from New France. In the 1640s, three French Jesuit missionaries to New France —St. 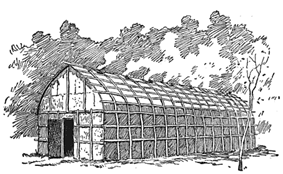 René Goupil, St. Isaac Jogues, and St. Jean de Lalande—were killed near the Mohawk village of Ossernenon, which was located at the confluence of the Schoharie and Mohawk rivers, where the modern town of Auriesville was later developed. They are considered to be the first three U.S. saints. England seized New Netherland by force in 1664, renaming it New York. The Dutch recaptured the colony nine years later, but ceded it to England under the Treaty of Westminster of 1674. In the eighteenth century, the British consolidated their hold on the region. German Palatines beginning in the 1720s. In what became known as the Albany Congress in 1754, delegates from seven of the thirteen British North American colonies met at Albany to pursue a treaty with the powerful Mohawk. Benjamin Franklin, a Pennsylvania delegate, proposed a plan for uniting the seven colonies that greatly exceeded the scope of the congress. The delegates spent most of their time debating this Albany Plan of union, one of the first attempts to form a union of the colonies "under one government as far as might be necessary for defense and other general important purposes". The delegates approved an amended version, but the colonies rejected it. To counter the French militarily, the British established forts along Lake Ontario and at portages between the Mohawk Valley and the adjacent Lake Champlain and Lake Ontario watersheds. The region became the area for many conflicts of the French and Indian War, such as the Battle of Fort Oswego (1756) and the Siege of Fort William Henry (which was later depicted in the work of James Fenimore Cooper), during the Seven Years' War. The British conquered New France by 1760 with the fall of Quebec. France formally ceded New France to the British in the Royal Proclamation of 1763, which established the western and northern boundary of the Province of New York at the limits of the Hudson, Mohawk and Delaware River watersheds. The area between that boundary and the Great Lakes and Saint Lawrence River, including west of the Appalachian Mountains, was to be the "Indian Reserve." 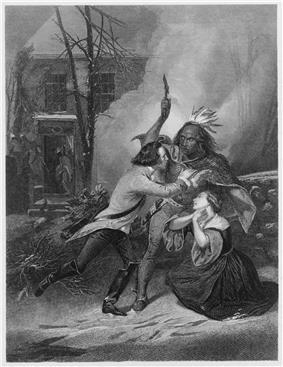 Between 1774 and 1783, deeply divided colonists waged civil war on each other directly and by proxy, through attacks such as the Seneca-led George Washington, drove thousands of the Haudenosaunee from their villages, farms and lands in the region in an effort to both avenge and prevent such attacks. The region was strategically important to the war plans of both the British and the Continental forces. 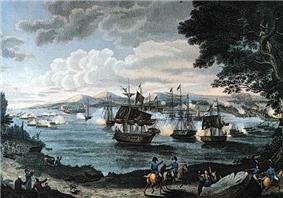 British efforts to divide the New England colonies from the rest led to battles including the Battle of Valcour Island and the Battle of Saratoga, a significant turning point in the war. While New York City remained in the hands of the British during most of the war, the upstate region was eventually dominated by the Colonial forces. At the end of the war, the Continental Army was headquartered in Newburgh. Uncertain that the Continental Congress would pay back wages, some Continental officers threatened an uprising in what became known as the Newburgh Conspiracy. After the American Revolution, Upstate New York became a really important place. The Treaty of Paris that ended the American Revolution established the border between New York and British North America. The 45th Parallel became the border with Quebec or Lower Canada. The St. Lawrence River, Lake Ontario, the Niagara River and Lake Erie became the border with Upper Canada. Great Britain continued to occupy military installations along the American shores of the Great Lakes until 1794, including Fort Niagara at the mouth of the Niagara River and Fort Ontario at the mouth of the Oswego River. The government of the new State of New York seized the property of New Yorkers who had remained loyal to the British crown. Thousands emigrated to colonies that remained under British rule, such as Nova Scotia and the newly established Upper Canada (now Ontario). Haudenosaunee who had fought with the British also fled. The British Crown granted a large tract of land in Upper Canada to their Haudenosaunee allies, who established the Grand River settlement. In the federal Treaty of Canandaigua, the new United States recognized the title of the remaining Haudenosaunee to the land north and west of the Proclamation Line of 1763. Nevertheless, New York state officials and private land agents sought through the early 19th century to extinguish Indian title to these lands via non-Federally-sanctioned treaties, such as the Treaty of Big Tree. The Treaties of Buffalo Creek were designed to finally remove the last of the native claims in Western New York as part of the federal Indian Removal program, but the purchaser failed to buy most of the land in time, and some of the tribes objected to their exclusion. Three of the four reservations remain in the region to this day; one of the reservations leased out their land to form the city of Salamanca, and the coexistence of the predominantly white city and the reservation has been a source of contention since the 1990s. Both before and after the Revolution, boundary disputes with other colonies and their successor states also complicated American settlement. In conflict with New York Colony's claims west of the Hudson Valley, which placed the entire region in the sprawling Albany County, Pennsylvania Colony claimed much of the Southern Tier until 1774, while Massachusetts Bay Colony claimed all of the region west of Massachusetts to the Great Lakes. The Province of New York also claimed jurisdiction east to the Connecticut River. To pursue this claim north of Connecticut and Massachusetts, New York granted lands to settlers in what is now Vermont at the same time that New Hampshire made grants of the same lands. When Vermont declared independence in 1777, the new Republic of Vermont recognized the New Hampshire grants over those of New York. New Yorkers who lost land in Vermont came to be known as the "Vermont Sufferers" and were granted new lands in 1788 in the Town of Bainbridge, New York. The dispute with Massachusetts over lands to the west of Massachusetts was settled in the 1786 Treaty of Hartford by dividing the rights to the land. The treaty granted sovereignty to the State of New York, but granted to the Commonwealth of Massachusetts the "pre-emptive" right to seek title to the land from the Haudenosaunee. The eastern boundary of the Massachusetts lands was thus known as the Preemption Line. This line runs from the Pennsylvania line due north to Lake Ontario, passing through Seneca Lake. The line was surveyed a second time due to initial errors. The Commonwealth of Massachusetts sold this land in large tracts, including the Phelps and Gorham Purchase and the Holland Purchase. Many of the settlers of what then became Central and Western New York came from the New England states. The Central New York Military Tract, where many of the townships were given the names of classical military and literary figures by Robert Harpur, was established to grant land to Revolutionary War veterans. Some of Northern New York was founded by the hundreds of Canadian exiles who had fought in the First and Second Canadian Regiments of the Continental Army, who were banished from Canada due to their rebellion against the Crown. Battles of the War of 1812 (1812–1815) were fought on the Niagara Frontier, in the Champlain Valley, including the Battle of Plattsburgh, in the St. Lawrence Valley, and on Lake Ontario, including the Battle of Sackets Harbor. The city of Buffalo was razed by the British as well. After the war, the US Government began to construct Fort Montgomery just south of the border at Rouses Point on Lake Champlain. Subsequently it was discovered that at that point, the actual 45th parallel was three-quarters of a mile south of the surveyed line, putting the Fort, which became known as "Fort Blunder", in Canada. This was not resolved until 1842 with the Webster-Ashburton Treaty, in which Great Britain and the United States decided to leave the border on the meandering line as surveyed. Slavery existed in New Netherland and the Province of New York. New York was in the 1690s the largest importer of slaves among the American colonies. Slavery did not end with the American Revolution, although John Jay introduced an emancipation bill into the State Assembly as early as 1777. Sojourner Truth was held as a slave in the Hudson Valley from the time she was born in 1797 until she escaped in 1826. Through efforts of the New York Manumission Society and others, New York began to adopt a policy of gradual emancipation in 1799. The law passed in 1817 that would finally emancipate slaves did not take effect for ten years, giving slaveowners an entire decade to sell their slaves away to other states. When the law finally took effect, the last 2,800 slaves in New York State were emancipated on July 4, 1827. Although routes for travel on foot and by canoe had existed across the region for hundreds of years, transportation of agricultural goods to market was expensive and slow. Influenced by the canals being built in Britain, leading citizens of New York began to press for the construction of a canal across the state. Governor DeWitt Clinton prevailed upon the legislature to charter and fund construction of a canal from Albany to Buffalo. 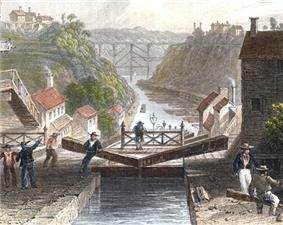 Construction of the Erie Canal began in 1817 and was completed in 1825. The canal allowed the area to become an important component of the 19th century industrial expansion in the United States. The canal also promoted trade with British North America and settlement of newer states in western territories. Later in the century the New York Central Railroad followed the "water-level route" from New York City to the Great Lakes, contributing to the industrialization of cities along its route. Several times in the nineteenth century, Upstate New York served as a staging area and refuge for Canadian rebels against Great Britain, as well as Irish-American invaders of Canada, straining British-American relations. In 1837 and 1838, in the aftermath of the Lower Canada Rebellion, some Québécois rebels escaped south to the North Country, while on the Niagara Frontier, events of the Upper Canada Rebellion, also known as the Patriot War, took place. In the late 1860s, some of the Fenian Raids were launched across the Niagara Frontier; Fenians also assembled in Malone. In the pre-Civil War era, Upstate New York became a major center of radical abolitionist activity and was an important nexus of the Underground Railroad. Resistance to the Fugitive Slave Act was particularly heated in the region, as evidenced by such events as the Jerry Rescue. The American women's rights movement was also born in Upstate New York at this time; the Seneca Falls Convention, the first women's rights convention, was held at Seneca Falls in 1848. Through the nineteenth century, Upstate New York was a hotbed of religious revivalism. A number of sects, such as the Shakers and the Oneida Community, established themselves in Upstate New York during that time. This led evangelist Charles Grandison Finney to coin the term the "Burned-Over District" for the region. Because of the comparative isolation of the region, many of the sects were non-conformist, and because of their non-traditional tenets they had numerous difficulties with government and other local people. The region is considered to be the cradle of Mormonism, as well as the Women's Suffrage movement. The Mormons, Seventh-day Adventists and Spiritualists are the only 21st century survivors of the hundreds of sects created during this time; some more mainstream churches, such as the Wesleyan Church and Free Methodist Church (both offshoots of Methodism that originated in political disputes with the mainline Methodist church), also survive. In the 19th century, extractive industries changed the landscape. Potash was manufactured as the land was cleared for farming. Logging was rampant in the Adirondacks. Iron was mined in the Adirondacks and the North Country. By the 1870s, business leaders, concerned about the effect of deforestation on the water supply necessary to the Erie Canal, advocated for the creation of forest preserves in the Adirondacks and the Catskills. The Adirondack Park and Catskill Park were created and strengthened by a series of legislation between 1885 and 1894, when the "Forever wild" provision of the New York State Constitution was added. During the era immediately following World War II, Upstate reached what was probably its peak influence in the national economy. 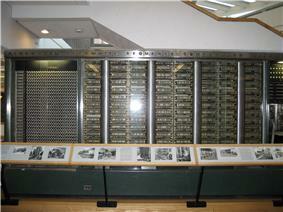 Major local corporations such as IBM, General Electric, Kodak, Xerox and Carrier had national success, producing cutting-edge products for business, government and consumers, and leadership in corporate culture. The opening of the New York State Thruway in the mid-1950s gave the region superior access to other eastern markets. This regional advantage faded as many local firms relocated certain operations to other states, or downsized in the face of foreign competition, similar to events in other areas in the American Rust Belt. Since the late 20th century, with the decline of manufacturing and its jobs, the area has generally suffered a net population loss. By contrast, many Amish and Mennonite families are recent arrivals to the area and have helped revive agriculture as part of the economy. Beginning in 1974, many Mennonite families moved to the Penn Yan area of Yates County from Lancaster County, Pennsylvania, seeking cheaper farmland. Amish communities have also been established in St. Lawrence, Montgomery, Chautauqua and Cattaraugus counties, and are making farming profitable. Artisans are reviving traditional specialty cheeses, and developing growing markets for their products, including shipping some items to the New York metropolitan market. A Greek-style yogurt is being produced Upstate by a recent immigrant, who has expanded his operation nationally. Additionally, Upstate New York continues to boast low crime rates, high educational prospects, and readily affordable daily essentials, earning Syracuse, Rochester, Albany, Schenectady, and Buffalo spots in the Forbes magazine list of top ten places to raise a family in the United States. Five of the six Iroquois nations have filed land claims against New York State (or have sought settlement of pending claims), based on late 18th-century treaties following the American Revolutionary War with the State of New York (which did not have constitutional authority to treat with American Indian nations) and the United States. Often attributed to the region's semi-rural character, there is more conservatism in culture and politics than found in the more urban downstate area, and is the power base of the state's Republican Party. Upstate New York does however have several Democratic counties including Erie County (Buffalo), Monroe County (Rochester), Onondaga County (Syracuse), Tompkins County (Ithaca), Albany County (Albany), Broome County (Binghamton), Clinton (Plattsburgh), Franklin County (Malone), St. Lawrence County (Massena, Potsdam, Ogdensburg) and Ulster County (Kingston, Woodstock, New Paltz). As a whole, Upstate New York is roughly equally divided in Federal elections between Democrats and Republicans. In George W. Bush by fewer than 1,500 votes (1,553,246 votes to 1,551,971) in the Upstate Region. New York City is dependent on upstate for a variety of services; it is the source of the city's water supply via the Delaware Aqueduct and the Catskill Aqueduct; much of the city's electric power supply comes from state owned hydroelectric plants at Niagara Falls and the St. Lawrence River; and most of the state's prisons are upstate; hence the popular term "being sent up the river" (however, the term originally referred to Sing Sing, which is "up the Hudson River" from New York City, but being in Ossining in Westchester County is still in the "downstate" region). Conversely, the operation of state facilities providing these services is an important part of the upstate economy. Frederick Douglass (1818–1895), editor and publisher of abolitionist newspapers: The North Star, published in Rochester, Frederick Douglass Weekly, Frederick Douglass' Paper, Douglass' Monthly and New National Era. Henry Jarvis Raymond, born in Lima, was the founder of the New York Times. He was the newspaper's editor until his death. James Watson Webb, born in Claverack and raised in Cooperstown, was the publisher of the New York newspapers the Morning Courier and the New York Enquirer, which he consolidated as the Courier and Enquirer. He also became a United States diplomat and a New York politician in the Whig and Republican parties. Saint Marianne Cope, American Catholic Sister who ministered to the Leper colony in Hawai'i without contracting the disease. Jehudi Ashmun, religious leader and social reformer born in Champlain, New York. He was an agent of the American Colonization Society which promoted the settlement of blacks at Monrovia, Liberia and was effectively governor of the colony from 1824 to 1828. Antoinette Brown, minister, abolitionist and suffragist. Born in Henrietta, she was the first woman to be ordained as a minister in the United States. She served a congregation in South Butler. Avery Dulles, S.J., born in Auburn. Noted theologian and cardinal of the Roman Catholic Church. Harry Emerson Fosdick, clergyman. He was born in Buffalo, and graduated from Colgate University. Walter Rauschenbusch, a Christian theologian, Baptist minister and a key figure in the Social Gospel movement in the United States, was born in Rochester. His father was a preacher who taught at the Rochester Theological Seminary. ^ Rodriguez v. Pataki, 308 F.Supp. 2d 346, 353, note 1, 369 (S.D.N.Y. 2004). ^ Included in this chapter are Buffalo, Rochester, Syracuse, Utica & Binghamton areas, and the following counties: Allegany, Broome, Cattaraugus, Cayuga, Chautaugua, Chemung, Chenango, Cortland, Erie, Genesee, Herkimer, Jefferson, Lewis, Livingston, Madison, Monroe, Niagara, Oneida, Onondaga, Ontario, Orleans, Oswego, Schuyler, Seneca, St. Lawrence, Steuben, Tioga, Tompkins, Wayne, Wyoming and Yates. Note that some northern counties in eastern New York, which are sometimes considered Upstate, are not included in that Arthritis Chapter. Among other counties not included in this chapter are Albany, Clinton, Columbia, Delaware, Essex, Fulton, Greene, Hamilton, Montgomery, Orange, Otsego, Putnam, Saratoga, Schenectady, Schoharie, Sullivan, Ulster, Warren, and Washington. ^ New York Times editorial (June 18, 2006). The Unsettling of Upstate America. New York Times. Retrieved 2011-08-05. ^ Benjamin, Elizabeth (August 5, 2011). Here and now. Retrieved 2011-08-05. 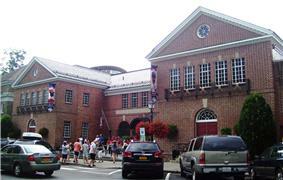 Item starting "Formerly of Upstate America..."
^ Seiler, Casey (July 19, 2010). AM Roundup: Cuomo visits upstate America. Times Union. Retrieved 2011-08-05. ^ What county is the most Irish in your state?
. Fayetteville, NY: Recorder Office, 1893.Indian Names in New YorkBeauchamp, William M.
Oral History of Franklin County — history of Franklin County NY in the late 19th and early 20th centuries.